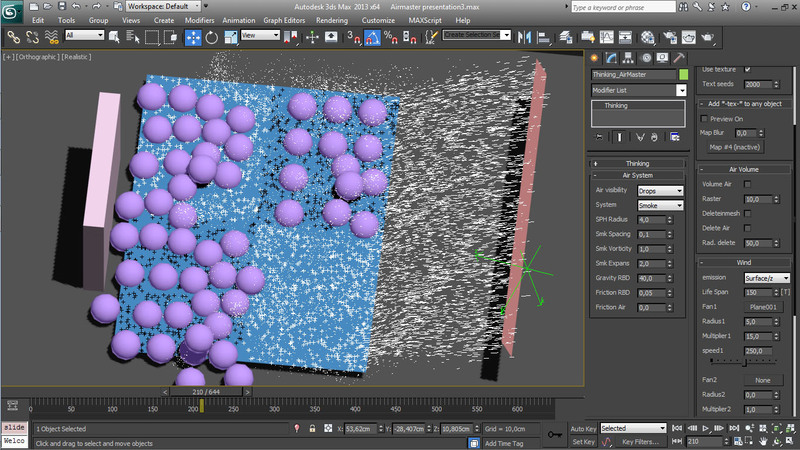 Air Master is a Thinking Particles tool to create realistic air behaviour in 3ds max. Are you tired of the dumb wind system on any particle system? Do you expect that your wind collide with your 3d objects, creates turbulence and everything you expect in real life? So this is what it does Air Master. If you move a big object in your 3d scene, even if dont touch your rigid bodies objects, this last ones will move because you move air on the scene, this motion propagates throught air and finally affect all your objects. Air Master can use an SPH, Smoke or hybrid system to create realistic air motion. You can create a Volume of air that your object will affect with his motion or create different wind objects (like fans) to move air. Objects will adquire this motion depending of his mass (heavy objects will be affected less than lighter objects). Also they use bullet physics to collide with other objects. Im using LayertoParticles, a new way to work in TP. You dont need anymore to select objects inside lists everytime. Simply create objects on the respective layers and will be automatically updated in TP, faster than ever! Also you can tag objects on his name to create additional actions. Adding -tex- to any 3d object name will create seeds around him taking his uv information. AM use the gradient color to affect more or less the rigid bodies. Lite version shows the basics of the system. With the pro version you have a more robust system, with Smoke or SPH+Smoke solver, Big objects (big objects affect air motion, and they dettect air motion with seeds on his surface), a Volume air system, you can pick up to 4 wind objects on your scene and use surface to emit from, and also a texture system, where objects will be affected more or less taking in consideration a greyscale texture. Air Master use some of the new tools available in TP 6.2, make sure to run at least 3dsmax 2013 and TP6.2. This looks great, was looking forward to trying it but your Lite version only seems to have a Max file in it, am I missing something needed to test this out? Hi Chris, this is in fact a TP tool. So you need TP installed. It comes with direct controls in your modifier panel. Doesnt work with TP 6.2 and 3d max 2016 dont loose your times. Does it work in TP 6.4 ?